Q. Can I access the Henderson Directories online? 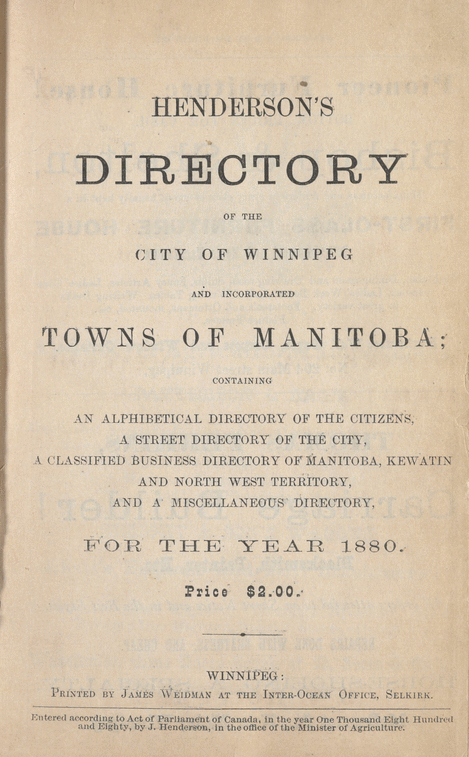 I'm looking for historical records about people or business that used to be in Winnipeg, Manitoba; something like the white or yellow pages phone books. Someone told me there might be something called the Henderson Directories available at the Winnipeg Public Library. Do you have them? Can I see them online? Yes, the Henderson Directories (sometimes called Henderson's Directories) are probably exactly what you need! We have both physical and digital copies of the Directories. We have physical Directories from 1880 to 2000. They can be found in the Local History Room on the 4th floor Millennium Library in Winnipeg's downtown. Online access to the Henderson Directories is available from 1880 to 1965. In partnership with the University of Alberta, Peel's Prairie Provinces has scanned and published these volumes in on searchable website. Online availability is limited to 50 years or more old content due to copyright.